Physical fitness information helps keep you healthy & is important for sports skill, but it’s not always clear what fit is. The U.S. government has guidelines & exercise tips for the activity levels that adults should maintain for 'optimum' fitness. I think of fitness as feeling healthy, limber, fast and strong. I'm 'fit' when I feel good about my body and abilities, and when I'm getting stronger and stronger week by week. I view the government standards as minimums, and you should really workout more. This overview will help you determine how fit you are, what fitness is for you, and how to improve your own fitness. The U.S. government printed official fitness information guidelines in 2008 for the ‘correct’ amount of activity for an adult. I think it’s a gross generalization to make the same guidelines for everyone and that these are minimum amounts to work-out per week. All adults should remain active. Any activity gives health benefits. For substantial health benefits, adults should spend 150 minutes, or 2 & 1/2 hours, a week doing moderate exercise, or 75 minutes doing intense exercise. For additional, extensive health benefits adults should increase their activity to 300 minutes or 5 hours of moderate exercise or 150 minutes (2 & ½ Hours) of vigorous, intense exercise. Adults should do muscle strengthening exercises that focus on major muscle groups 2 days a week. Moderate exercises include walking, slow bicycling, or gardening. The moderate exercises are very low intensity in my opinion, and if you aren't used to exercise they are a place to start. Vigorous, intense exercise includes swimming laps, jumping rope, or running. This is intense and, in my opinion, what aerobic exercise should be. But, get doing other stuff once you get in shape. 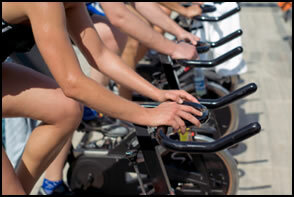 Serious running, mountain biking, sports, and vigorous exercises are great for building a more healthy body. There's also The President's Challenge (opens a new window), an adult fitness test that measures your fitness compared to other Americans. This is a great way to see where your baseline is for fitness. The advice given with the test says that there are 4 components of physical fitness: aerobic ability, muscular strength and endurance, flexibility, and body composition. I like this new idea of fitness, since the physical fitness information takes 4 separate and useful measures of your body to get a gauge of your overall 'fitness'. It gives you a well rounded view of your current fitness level. Basically, fitness is how ‘in shape’ you are. You can measure yourself against your friends doing the same sports or the average American. However, you need to include strength and aerobics at least, and flexibility and body composition if you want to get serious. Taken into account, these show a complete picture of how healthy you are. I think that weight training and being strong is a vital part of physical fitness. There are tons of good reasons to start a strength training workout, and complementing that with a exercise program will get you in awesome shape. You'll be strong and have endurance, and exercise will get really fun. Get stronger, start working out, get physical fitness information to improve your routine, and 'fitness' will just keep going up! • Click HERE to leave 'Physical Fitness Information: A Guide' & learn more about the benefits of physical fitness! • Click HERE to go to the Complete Strength Training Home-page!